It wouldn't be a kid's party without lots of entertainment! 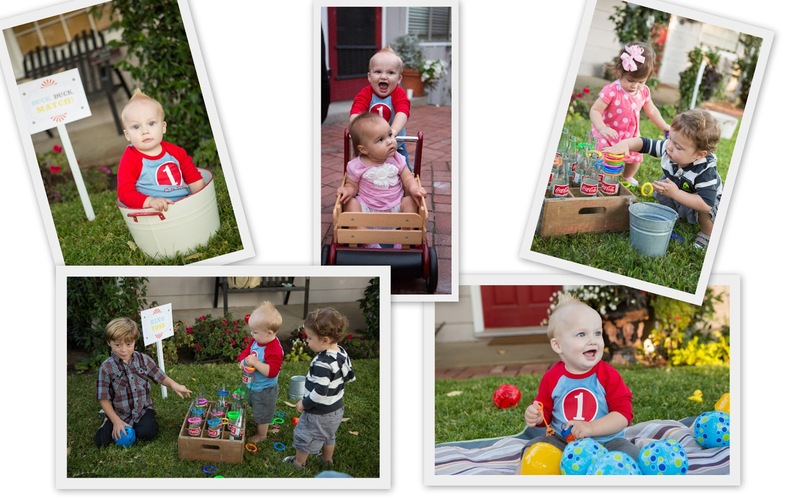 We invited plenty of pint-sized guests to Carson's big party. It seems that these days most of our good times revolve around our little fella's good times, so we figured as long as the kid's were having fun, the grown-ups would be too. 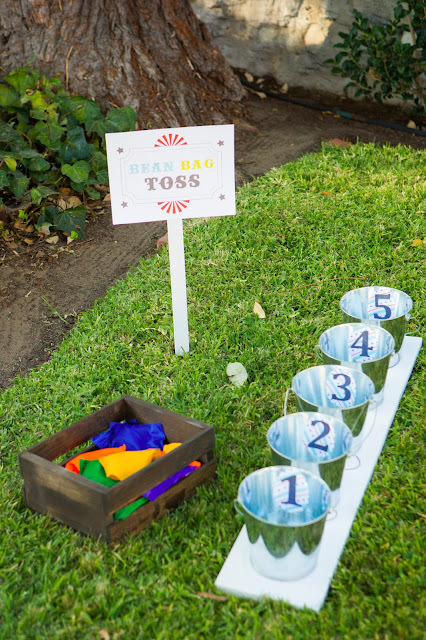 The front yard was filled with vintage inspired carnival games, picnic blankets, bubbles and balls. It sure seemed like the entertainment was a hit! I created the bean bag toss with a 1"x 8" board cut to the right length and spray painted white. I super glued industrial strength magnets to the board where I wanted to place each of the 5 buckets (I wanted them to be removable). I then used these buckets from JoAnn's. I customized each bucket with a number 1-5 printed on one of Luvalexa's printable papers, cut out with this craft punch, and glued on and sealed with mod podge. The bean bags are from Oriental Trading Co. and they're sitting in this crate from JoAnn's, which I stained with Minwax dark walnut stain. I used an antique bottle crate that I already owned (they're easy to find at flea markets or Pottery Barn has reproductions) to hold the glass coke bottles (available at Costco or Smart & Final). 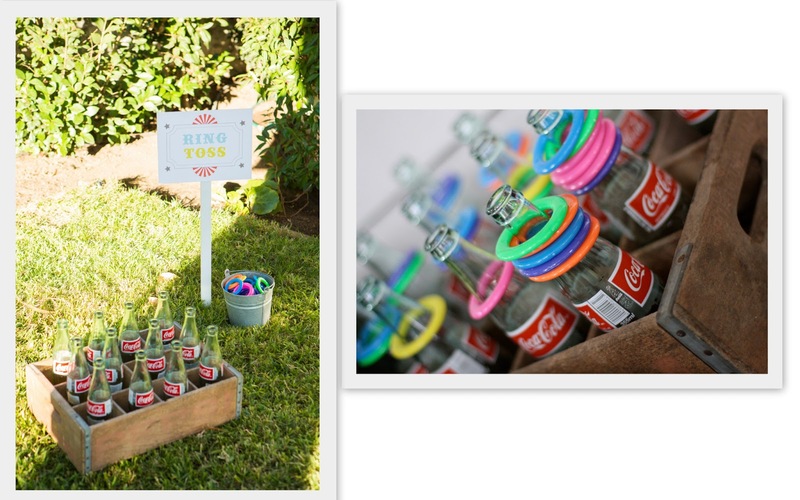 The cane rack rings are available through Oriental Trading Co. 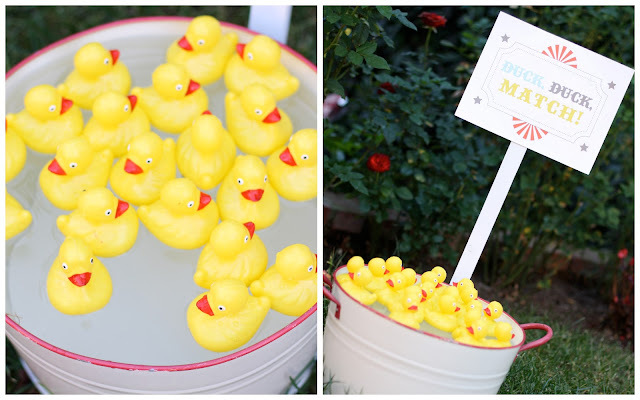 The ducks are from Oriental Trading Co., they're floating in an old ice bucket. I found the "super miracle bubbles" at Party City. They're customized with the cupcake toppers from Luvalexa's party printables and some mod podge. 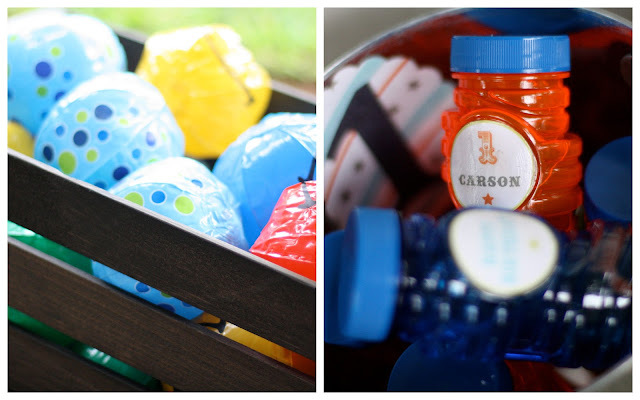 The mini beach balls are from Oriental Trading Co. and are in a larger stained JoAnn's crate. Looks like all the games were quite a hit! The birthday boy sure enjoyed himself . That is what this day was ALL about, after all! You can find more details from Carson's 1st Birthday party here and here. 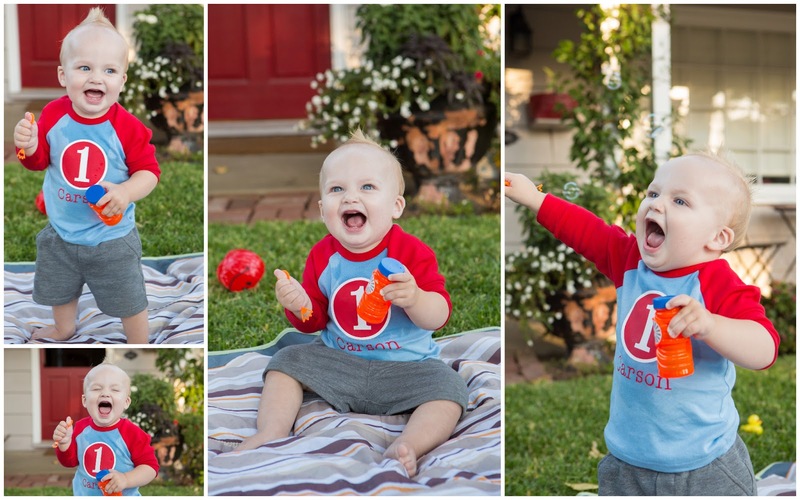 Carson's shirt is from the adorable etsy shop flyduds! Photos are by SDK photo!